At the beginning of every Boston University men’s lacrosse game, all eyes are on junior midfielder Joe Stucky at the center faceoff X. Though he is on the field for mere moments of the 60-minute game, he faces a difficult feat time after time. What makes the challenge all the more intimidating is the fact that he has stepped into the role previously filled by senior midfielder and faceoff specialist Sam Talkow, who has missed this season due to injury. While Stucky has taken the opening faceoff in all 11 games this year, things have not always been this way. Talkow, who has yet to take the field this season, was the reigning faceoff specialist for the Terriers over the past three seasons and ended last season third in the nation with a 0.695 success percentage. The absence of any player in a key role on the team can be a cause for concern, yet the Potomac, Maryland native did not show panic before play began. This calmness Stucky exudes comes as no surprise, as pressure is something faceoff specialists confront frequently on the field. It is actually what Stucky finds thrilling about the position. This mentality has not only been cultivated, but also solidified over the past two and a half years during his career. 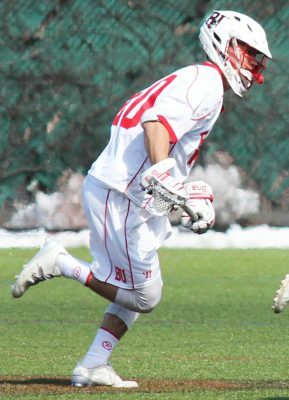 Prior to this year, Stucky predominantly sat on the sidelines as Talkow and former midfielder and faceoff specialist Elliott Burr took to centerfield. While hard work and training prepared Stucky to take on the role when needed, his call came a year earlier than expected. However, the training from Talkow and Burr ensured that Stucky would be well equipped for the transition. BU head coach Ryan Polley noted that the distinct styles Talkow and Burr possess significantly helped Stucky evolve into his role. Only three games into this year’s campaign, against the University of Hartford, Stucky demonstrated the ease of transition into his new role as he went over 50 percent (12-for-21) against Dylan Protesto, the nation’s 10th leading faceoff specialist. In matchups against the University of Massachusetts Lowell, Bucknell University and Lafayette College, Stucky has cemented his role as a reliable faceoff option. The contest showcased his best performance yet, as he went 18-for-25 at the X and collected six ground balls in the 13-8 victory. In his last three games, he has won 45-of-67 draws, rendering himself successful 67.2 percent of the time. He has also been strong on the ground ball battle and collected 26 over the same three games, which is almost half the amount he has picked up all season. Polley highlighted Stucky’s ability to foster scoring chances in transition, but also his contribution to the team away from the battle at the X. With five games left in the regular season and four in the Patriot League, Stucky’s role will remain as crucial as ever. He looks at the rest of the season with anticipation though, as his role is key in winning possession for the second-highest scoring offense in the Patriot League. As for Polley, he hopes to see Stucky continue to develop into a reliable player. So proud of Joe! Keep up the hard work dog.